Do they have any idea what I’m saying? Probably not. Not till the first apple chunks hit the first food dish and the next sound is crunching or, in one case, flinging. Only one fling, for in the very act of flinging I’m sure the delectable apple juice that resulted was enough to convince even Ruby not to fling the remaining pieces. The apples are from our own trees, unsprayed and healthy, though not the epitome of magazine apples that are blemish-free globes of perfection. We didn’t get too many this year, as we only take the best and least blemished. Not enough to make applesauce, but enough to make a few hand pies and enough to make the birds happy. There may even be enough left to make an apple pie for Thanksgiving. The crunching in the birdroom was satisfying for all, including me. I tend to give the birds the Beans/Rice/Veggie mix and alternate that with eggfood, with fruit being a much less frequent treat. The exception would be when I have baby greys; at that time I want to make sure they are introduced to apples and oranges and grapes so that they will like them and not be reluctant to try them when they are older. So when I have plenty of fruit in the house for the babies, all the birds get more of it. We have lots of blueberries in the summer; big, juicy berries grown on high bush plants that give us so many that I can freeze enough of them to last the entire year. So far none of the birds has shown any great liking for them. More often than not, they end up tossed out of the cage. This is not a fun thing for me since a blueberry unseen and stepped on and squished into the rug is cause for a few choice words that I’d rather the birds did not learn. We also have grapes, and finally we have planted grapes of a sweet and semi-seedless nature so perhaps Scott and I might actually get to enjoy them in another year. This was the first year that we saw fruit, and the birds did get a little taste of them but it was more the outside birds that got the full benefit. The grapes we had planted previously would cause your mouth to pucker as much as the sourest lemon. Scott moved them to the edge of the woods when we got this new, sweet variety, and they are thriving there where the wild critters are no doubt enjoying them. We’ve also planted some raspberries and hope they will finally decide they like it here next summer and bear a bit more fruit. This land is more rock than soil, it seems, and it always takes a few years (sometimes many years) before things decide to embrace their conditions and actually thrive. When we moved here there was a lone lilac. Now, understand that I LOVE lilacs! Absolutely love them. This lone lilac did not flower. We moved it, we cut it back, we added lime to the soil… nothing. Not a bloom. I think it was not until we finally cut a ton of trees down and let some real light in that it was finally happy. (As were we.) Now we have a ton of lilacs and several varieties, and they all love it here. We also have a dwarf cherry tree for which I have high hopes. It did really well in the growth department this summer, and produced a couple cherries. Next year I’d expect to see that happen again with even more fruit produced. Cherries are wonderful for reducing inflammation in the joints, and it would be wonderful to have our own. It’s been a while since I posted an update on the bird situation so I will do that now. On the chicken front, we ended up getting rid of NINE roosters and keeping two. We also did get three new hens out of the fourteen kids. Not very good odds when you figure you should get about a 50-50 mix of males and females! We plan to try to cross our White Headed Black Polish banty hens with the blue mottled cochin banty rooster we have kept, with the hopes that this cross will not be very prone to being broody. Though we love these cochins, we are not crazy about how often they go broody. They get so broody that they forget to eat and we even lost one that way! Now when they go broody we continue to eject the hen from the nest, and after several days of that it seems to do the trick and get her out of the mood. With all the extra roosters gone, it’s amazing how peaceful the coop is. Really nice, and of course they all have so much more room now, too. 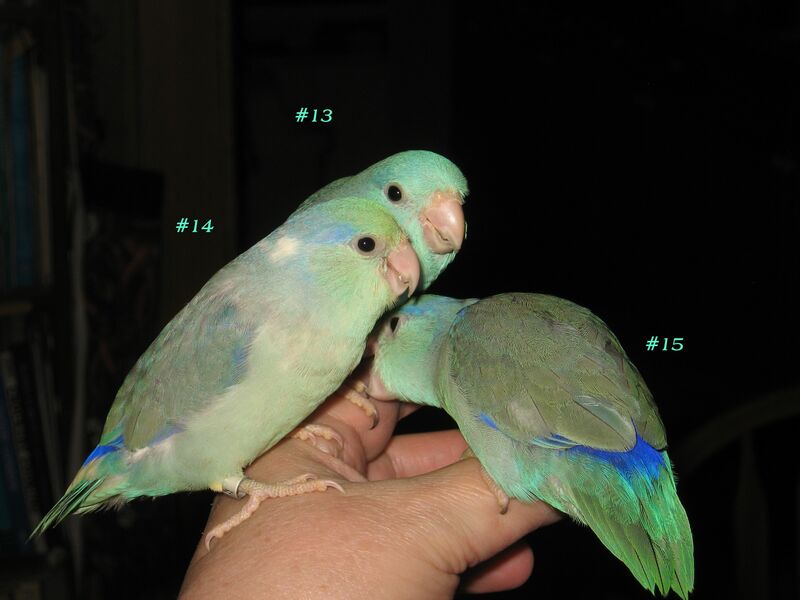 On the parrotlet front, I have two young pairs for sale or trade. They should be perfect for breeding next year when they are old enough as they will have grown up together (but are totally unrelated) and should be really well-bonded. 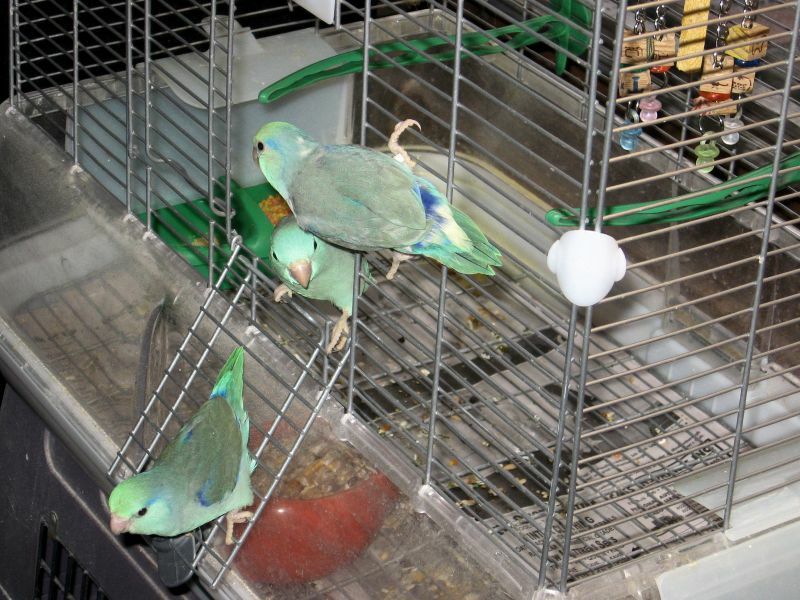 I also have two handfed parrotlet kids still for sale that are now between eight and nine weeks old. 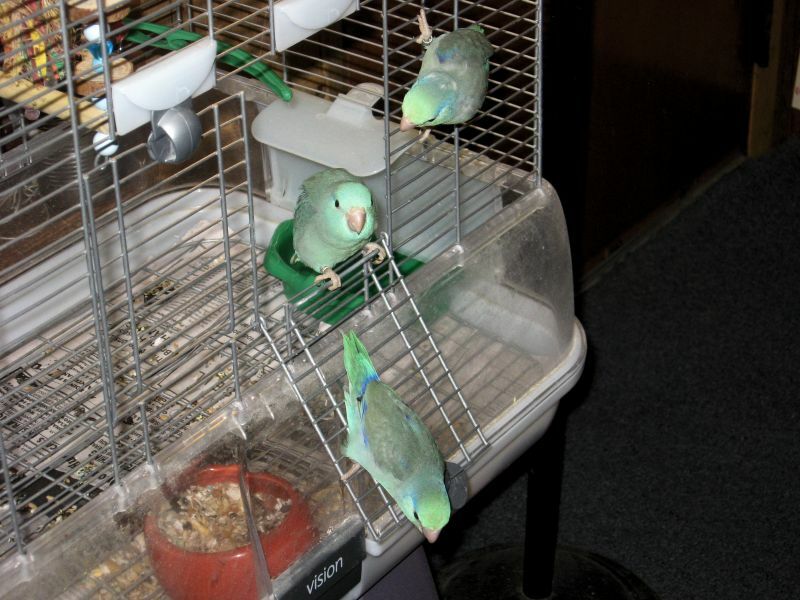 One is a turquoise pied male and the other is a blue male. Very nice kids. This is how they look about two seconds after I open their cage door! They can’t wait to come out. Last, but certainly not least, is the lone Timneh African Grey I am handfeeding. His DNA test results show him to be a male. He already has a deposit and his future owners have named him Tracker. I like it a lot. Seems to fit him. He is now 34 days old and weighed in this morning at 242 grams. He took his first weaning pellets today, too, so graduated to being let loose in the brooder. For info on any of the birds for sale, please check out the sale page on my website.